Have you ever wondered what University City looked like at its beginning, or wonder where the first houses were built? Might you be one of the original settlers? This photograph taken by Howard Rozelle on November 15, 1960 shows the original development of University City. The light-colored areas along the bottom of the picture are the first subdivisions. At the time, the only paved road into UC was Regents Road. State Highway 52 and Governor Drive had not been constructed. Genesee Avenue did not yet extend down the hill from Clairemont. 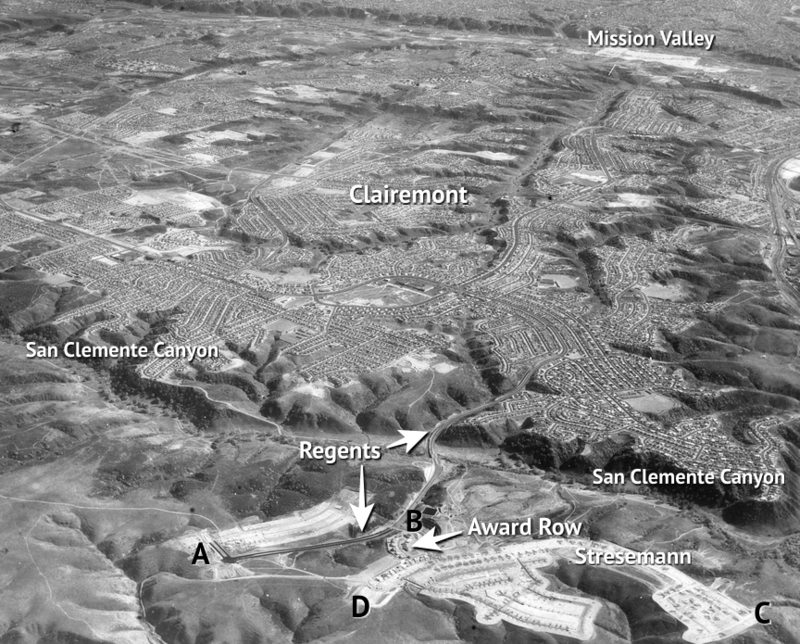 Regents Road originates in south Clairemont and travels northbound across the bottom of San Clemente Canyon and up the other side to where the Sprouts shopping center is today (A). About halfway up the hill, Regents Road intersects with Pennant Way (B) which goes past Honors Drive and ends in a T- intersection at Stresemann Street. If you travel south on Honors Drive, you will arrive at Award Row where the original model homes were built. Here today you can see the butterfly roof house of a Mid Century Modern home designed by William Krisel, the pioneering architect who was commissioned to design the University City tract in 1960. Nearby, Stresemann St. makes an arc to the right and becomes Soderblom Avenue, ending at a T- intersection with Bloch St (C). Additional information and pictures about the development of University City can be seen in the posts in the category “University City History”. See also “Pictures & History of UC” and “William Krisel’s University City Development” under the Photo Albums tab www.universitycitynews.org/history-of-uc/. Special thanks to John Fry, president of the Pacific Beach Historical Society, for use of the photograph. 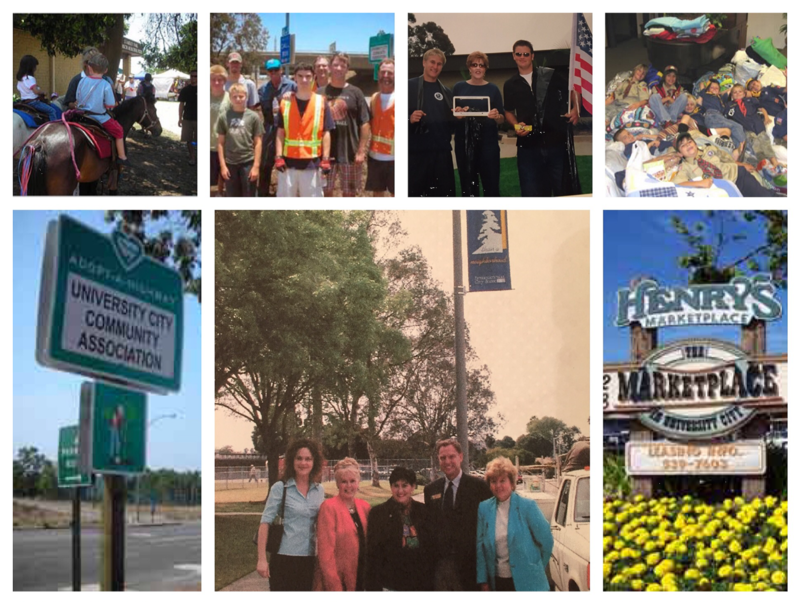 UCCA Marks 15-Year Anniversary: It Started with L.O.V.E.